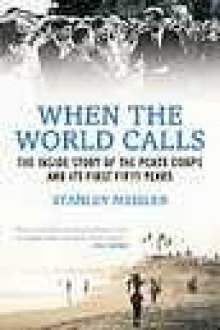 When I received my review copy of Stanley Meisler's "When the World Calls: The Inside Story of the Peace Corps and Its First Fifty Years" (Beacon Press, 288 pages, $26.95) I was frankly surprised that the Peace Corps -- founded in 1961, the year I graduated from college -- was still functioning. Obviously, the Peace Corps not as high profile as it was in the 1960s or in subsequent decades, but in 2009 there were 7,671 "Volunteers" -- the odd name chosen for those idealistic souls who sign up for service in what used to be called "Third World" countries. That designation is so un-PC today, when countries are called "developing," but using a word like "Volunteers" (Meisler capitalizes it throughout) suggests there was a draft or something like it for Peace Corps people. Meisler, a former foreign correspondent for the Los Angeles Times and a staffer at the Peace Corps for several years, is an engaging and graceful writer and he includes statistics like the one above. In its peak year, 1966, there were 15,556 Volunteers. In the early years of the Corps, Meisler was deputy director of the Peace Corps’ Office of Evaluation and Research, but "When the World Calls" is anything but a cleaned up, authorized history of the organization. Meisler deals frankly with the scandals and controversies involving volunteers, including young Paul Theroux, later a best-selling novelist and travel writer, in Malawi. The calls 'em as he sees 'em Theroux, to the surprise of no one who has read his books, was accused of meddling in the African nation's internal affairs and was expelled. Born in Massachusetts in 1941, Theroux served in the Peace Corps from 1963 to 1965, teaching in Malawi. While there, he helped a political opponent of Malawi President Hastings Banda escape to Uganda, for which he was expelled from Malawi and dismissed from the Peace Corps. He certainly deserves a "Profile in Courage," but didn't get one at the time! Banda reportedly kept a crocodile pool to dispose of his enemies. Theroux, who contributes a paragraph of praise for Meisler's book, is lucky he didn't end up swimming with the crocs! Other controversies involved sexual hook-ups, as we would call them now, to be expected when young people are thrown together in exotic foreign locales. There were a number of murders and suicides involving Volunteers, but probably not more than one would expect from a similar sample of people not in the Corps but of the same age group. The median age of Volunteers in 2009 was 25, Meisler writes, but almost 7 percent of the 7,671 Volunteers and trainees were over the age of 50 -- old enough to join AARP. That said, there were a number of older Peace Corps Volunteers from the start, including Jimmy Carter's mother Lillian. In 1966, at the age of 68, the future president's mother (he was then governor of Georgia) decided to be a Peace Corps Volunteer. After completing a psychiatric evaluation, she received three months of training and was sent to India where she worked at the Godrej Colony 30 miles from Bombay, now called Mumbai, where she worked for 21 months. The Atlanta Regional Office of the Peace Corps has named an award in her honor for volunteers over 50 who make the biggest contribution. The Peace Corps will always be identified with its first director, R. Sargent Shriver (1915-2011), Kennedy's brother in law, who died January 18, 2011, but its genesis dates back to the Kennedy campaign for President, specifically on October 14, 1960, at an impromptu speech at the University of Michigan, where the 1960 Democratic candidate presented an idea to the students in Ann Arbor for an organization that would rally American youth in service. Shriver took the idea, presented in a speech that lasted all of three minutes, and ran with it, shaping and creating the organization we know today. As the numbers cited above indicated (and contained in a chart supplied by Meisler listing the number of Volunteers from 1962 to 2009) the Corps attracted enthusiastic supporters. The first contingent arrived in Ghana on Aug. 30, 1961, while I was settling into my first post-college job as an insurance claims adjuster in Chicago's Loop. Shriver was married to JFK's sister Eunice and was a distinguished public servant. In addition to shaping the Peace Corps, which he headed until 1966, he founded the Job Corps, Head Start and other programs as the architect of Lyndon B. Johnson's "War on Poverty." He served as the U.S. Ambassador to France and was the vice presidential pick of George McGovern in the 1972 campaign. Meisler traces the history of the Peace Corps through the past nine presidential administrations and reveals, for example, how Lyndon Johnson became furious when Volunteers opposed his invasion of the Dominican Republic. He tells how Richard Nixon literally tried to destroy the Peace Corps, and how Ronald Reagan endeavored to make it an instrument of foreign policy in Central America. He describes how the Peace Corps angered the rulers of countries as diverse as Ethiopia, Peru and Bolivia, who shut down programs there or, in the case of Bolivia, the Corps decided to shut down the program and fly out all 113 volunteers in 2008. The issue of the CIA and the Peace Corps is dealt with head on, including the proviso that the CIA had to wait five years before hiring former Peace Corps Volunteers. Despite the diminished numbers, in 2010, Meisler wrties, there were more Americans serving in the Peace Corps than there have been since 1970. The list of alumni, numbering about 200,000, includes members of Congress, cabinet members, ambassadors, novelists, journalists, mayors, and university presidets, as well as many others who haven't been widely celebrated. One of the more well-known Volunteers, Donna E. Shalala, served as secretary of Health and Human Services in the Clinton administration and is now president of the University of Miami. She also contributed a blurb for Meisler's book (she served in Iran, obviously before the Shah was deposed). In his "Afterword," beginning on Page 218, Meisler lists some of the more famous Volunteers and asks the question "Does the Peace Corps Do Any Good?" You'll have to read the book and decide for yourself, but for many people who voted for JFK (I count myself among them; I had just turned 22 and it was my first time at the polls) the Peace Corps represents the zenith of the idealism exemplified by the famous challenge in his inaugural address on Jan. 20, 1961: "And so my fellow Americans, ask not what your country can do for you; ask what you can do for your country." Serving in the Peace Corps, according to the Volunteers interviewed by Meisler, was perhaps the fullest response to that challenge. I've read and reviewed Meisler's earlier book on former UN Secretary General Kofi Annan and found "When the World Calls" an even better book. Full disclosure: I worked for the same newspaper, the Los Angeles Times, where Meisler toiled for 30 years starting in 1967 as a foreign correspondent. I never met him -- I still haven't -- but I read and admired his reporting and writing and we correspond via e-mail. He was assigned to Nairobi, Mexico City, Madrid, Toronto, Paris, Barcelona, the UN and Washington. He still contributes articles to the L.A. Times and writes a news commentary for his website www.stanleymeisler.com.